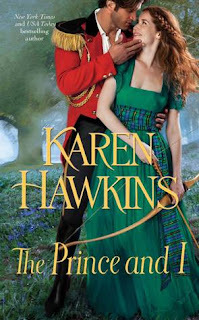 Sizzling Scottish romance abounds in this e-novella in the Princes of Oxenburg series, a spinoff to New York Times bestselling author Karen Hawkins’s delightful Duchess Diaries series. 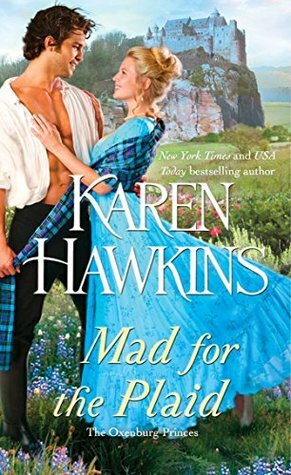 The challenge of winning his way into Tatiana’s heavily protected heart stirs Buchan back to life…but can he and his twisted leg—and broken heart—win a proud princess whose only goal is to leave Scotland and return to the court where she’s the crowning jewel. 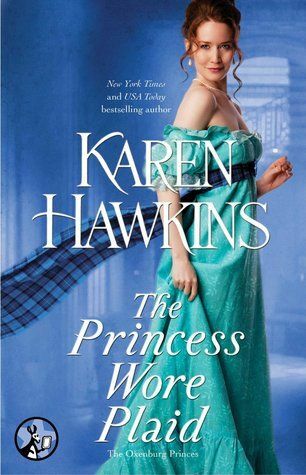 The Princess Wore Plaid by Karen Hawkins is a 2016 Pocket Star publication. I was provided a copy of this book by the publisher, Edelweiss, and as a member of the official street team of XOXO After Dark. It is always a pleasure to read one of Karen Hawkins’ historical romance novels. This is a novella length story and is a part of the Oxenburg Princes series. Most of the time fairytales end with the heroine marrying her prince, becoming a princess as a result, and living happily ever after, leaving us all sighing with happiness, because the prince is so handsome and being a princess sounds so cool and because who doesn’t want to be a princess… right? In this “Beauty and the Beast’ inspired story, Tatiana, a princess, on her way to the Scottish Highlands to meet her cousin, suffers temporary memory loss after a carriage accident. Making her way to an inn, she is taken in by the owner and given a job in the kitchen. Once her memory returns, she contacts her family, but nobody ever comes to retrieve her. Meanwhile, French Navy Lord Buchan, leaves home once a week to enjoy the outstanding cooking at the inn, which is how he meets the mysterious Tatiana. But, Buchan is a hard man to like due to the disfiguring injury to his leg, which has left him bitter, lonely, and in constant pain. But, he soon figures out that Tatiana is no servant, and believes she is who she claims to be. So, he vows to help her reunite with her family. However, he never expected she would bring him out of his self-imposed exile and give him a reason to live. Away from her life at court, Tatiana finds herself enjoying being just a woman, letting her guard down, and enjoying the pleasures of cooking, and certain other pleasures the gruff Buchan is teaching her all about. But, Buchan knows Tatiana doesn’t belong in his world and once her cousin arrives, she will go back to her opulent world of royalty and resume the life she was born to. Are Buchan and Tatiana star-crossed lovers? Is their HEA doomed from the start? Only time and love will tell. I really enjoyed this Scottish fairytale inspired story, which examines the effect of removing a princess from her duty bound life of stress and expectations, and seeing her blossom as a person in a completely different environment and perhaps finding true love in the process, creating a kind of HEA in reverse. This is a cute, imaginative short story which also introduces us to Tatiana’s cousin who will be featured in “Mad for the Plaid” coming this summer. The third captivating, sizzling Scottish historical romance in New York Times bestseller Karen Hawkins's Princes of Oxenburg series. 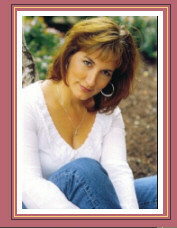 Fans of Julia Quinn, Monica McCarty and Julie Garwood will be enchanted by this dazzling read. While her five older sisters all enjoyed seasons, got married to men of high station, and had children of their own, Lyssa, the baby of the family, was left at home to be raised by her absent father and her sharp-witted, but ailing grandmother after losing her mother in childbirth. Now twenty-nine years old, the sole caretaker of her grandmother, and the entrenched mistress of the castle, Lyssa has resigned herself to living at the castle and enjoying the amusements offered - spending time with her grandmother, copious amounts of reading, wild rides through the moors, and the occasional ball in the local town. All in all, it's a satisfying, if sedate, life . . . But when she meets a guard more handsome, and far more arrogant and sure of himself than any man she's ever met, she's determined to figure out his secrets, no matter the cost. 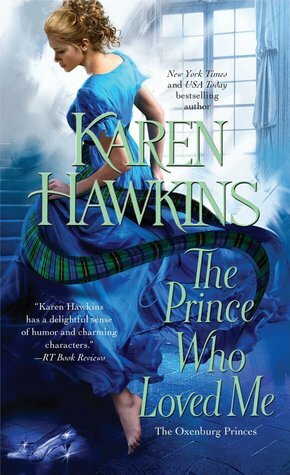 Don't miss the previous sublime Princes of Oxenburg books: The Prince Who Loved Me,The Prince And I and The Princess Wore Plaid. And for more umissable Scottish historical romance, catch her amazing Duchess Diaries series. New York Times and USA Today best-selling author Karen Hawkins is known for her wonderfully humorous and emotion-tugging historical and contemporary romances. The author of over 30 novels, Karen writes for a living between shopping for shoes, playing around on Facebook and Pinterest, looking for fun items for Hawkins Manor, and napping, although usually not at the same time. Sometimes, for fun, she takes Instagram pictures of her two rescue dogs, Sadie and Teke, and posts them online. Yeah, she's a wild one. Karen lives in balmy Orlando, Florida, with her husband, aka Hot Cop, and her two dogs. Her children are both out of college and have become productive, non-violent members of society. Karen writes six to eight hours a day when not obsessively reading research books on Regency-era Scotland, snacking on chocolate, or looking out the windows of her house and thinking about gardening. Her hobbies include sculpting, oil painting, playing badminton, and -- ok, ok, she doesn't have any hobbies, but if she did, she's sure they'd be something refined and fascinating. If you'd like to keep up with Karen's crazed and hectic schedule, win free books, find out about her coming releases, or just want to engage in some easy on-line snooping, sign up for Karen's amazing newsletter!